Should You Buy a Separate Ceremony and Reception Dress? We Outline the Pros and Cons. When Meghan Markle stepped out of Queen Elizabeth II’s Rolls-Royce Phantom IV, we oohed and sighed at the sight of her sculptural Givenchy wedding dress with its sophisticated boatneck, long sleeves, and sweeping train. Then, when the newly minted Duke and Duchess of Sussex walked out of their wedding reception, we were again stunned by the Duchess’ separate reception dress, a mock-neck, fitted, flared white gown that showed off her sculpted shoulders. For more royal wedding indulgence, click here to read our blog, Steal These Royal Wedding Tips for Your Big Day. Brides have been investing in separate ceremony and reception gowns for many years, but for those of us who take our cues from the Royals, even if we haven’t thought about separate dresses before, Meghan’s stunning style is making us wonder if there is more to the trend than just the desire to choose the final two dresses we couldn’t decide between during all our wedding dress shopping spree. To help you determine if you should invest in both a ceremony and reception dress, we’ve outlined the critical pros and cons. You can pair your dress to better suit your venues. If your ceremony takes place in a lavish, elegant church, you’ll need an extravagant gown, but if your reception takes place in a more intimate, modern setting, or on a beach your 15-foot train and fingertip length lace sleeves may be too much. You can party all night long in a more dance-floor-friendly gown. That mermaid-style dress you wore to your ceremony may be gorgeous, but it will limit your range of motion on the dancefloor. A shorter dress or even one with a free-flowing skirt that doesn’t come close to touching the floor will give you the freedom to thoroughly enjoy your reception’s party atmosphere. A second dress may offer greater comfort during a long day. If your ceremony takes place in the morning, and you have hours of photo-taking in the afternoon, but the time you get to your reception, you may be craving a break from the heavy, intricate gown you have been hauling around all day. A reception dress may give you better comfort during the evening’s festivities. Double the dresses equal double the cost. That’s not to say you can’t find the wedding dress of your dreams at a reasonable price, but if you plan to invest in two gowns, you may have to tighten up your overall wedding dress budget. You may not have enough time to change if your reception directly follows the ceremony. 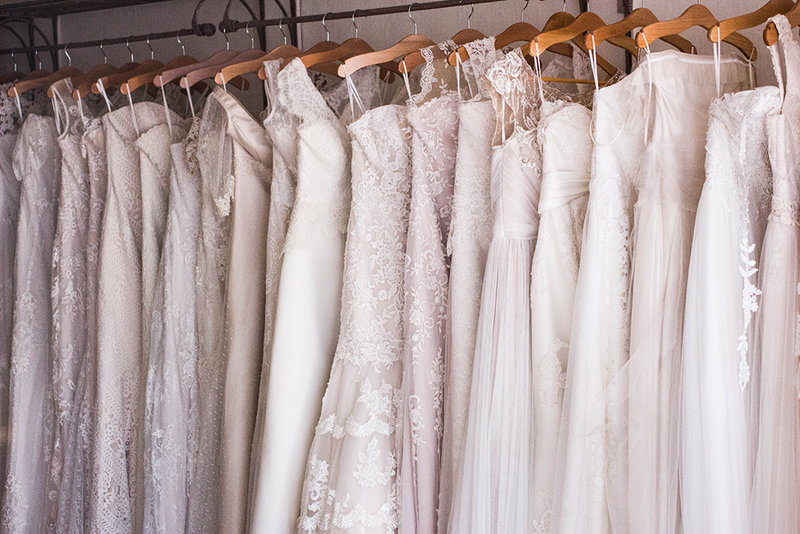 Remember, one of the reasons you need a bridal party is for dress management. It can be a labor of love getting into and out of any gown with 50 satin buttons up the back, even if it does make you look positively gorgeous. You’ll only wear both dresses once. Some women feel guilty about investing in a gown that costs thousands of dollars knowing they will only wear it for one day. You may feel double that guilt when you double the cost and the number of gowns. You’ll also need more space to store your dresses if you plan to save them for posterity. No matter how many dresses you decide to wear during your wedding (although, maybe don’t treat it like an Oscar ceremony and change a dozen times), make sure you choose a dress that flatters your figure and makes you feel like the princess you are on your wedding day. Click here to read our tips on How to Choose the Right Wedding Dress. < Previous Moving? Six Cute Ways to Announce Your Move.